Hello, hello ladies and gentlemen. It has been a bit since my last blog entry, and I thought what better day to do it than on the birthday of Carl Roger (1902) Psychotherapist and founder of Rogerian Therapy which in short means being nice to people. "So you are being charged with molesting a dead horse.......wow, I bet you are the tops in your area of expertise." It is also the birthday for Stephen Hawking (1942) a really smart guy and Peter Gil (1964) of Frankie Goes to Hollywood rock fame. You know the song, "Relax, don't do it when you wanna....." you know the rest and will be stuck in your head for at least a few hours. You're welcome. 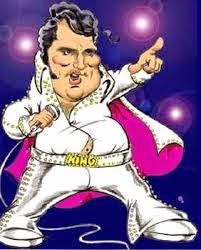 It just so happens to also be the 80th birthday of Elvis A. Presley, the King of Rock and Roll. While I was never an Elvis fan, my mother, brother, father, sister, boss, and about 4,988,933,456 people apparently think quite highly of him. So I am in the minority. Nice. I did hear something on NPR that made me appreciate Elvis a little bit more: the Elvis milkshake. The ingredients, and I kid you not, are ice cream, a little bourbon, two very ripe bananas, peanut butter, crispy fried and crumbled bacon, and a little dab of bacon grease. COME AWAY FROM THE LIGHT MR. STONE!!!!!! Excuse me while I wipe away the drool. You have to admit it sounds really good. Anybody that appreciated bacon the way the spangly clad, hip gyrating, young lad from Tupelo, MS did can't be all bad. Just thinking about it makes me get all shook up. Which leads to my next topic: competitions in 2015. With my new position at work, I am going to have to be a bit more restricted on my competitions. I'm looking at the KCBS one in Pensacola, the one at the Islandview Casino in Gulfport, and of course the FBA event in Dothan, AL. I might get to squeeze in Perry, FL or the KCBS in Bainbridge. To be honest, since I lost my mom in August, I haven't really been into the idea of competing. I still love me some BBQ to be sure, but just have to get over the hump so to speak. She used to come to all the contests, and cheered really loud even if we finished in the middle or end of the pack. I sure miss her, but as Poison said in the early 90's Life Goes On. On a brighter note, I did have the chance to spend some time with Forrest Dilmore, Bobby Lankford, and Keith Fern. Forrest prepared us one of his super fine breakfasts a-la dutch over style one Saturday, and I still have dreams about that grub. This year also brought me a new addition to the family. The Igor Mk. 1.0. I have had some problems with parts quitting on me but the nice folks at Smoke Daddy made it right with replacement parts. Hopefully, those problems are behind me. Now I just have to get my a-mazing pellet smoke thingy in the mail so I can get some smoke flavor to items cooked on Igor. Pellet smoking is very convenient to be sure, but it doesn't hold a candle to the Frankensmoker Mk. 2.3 when it comes to smoke flavor. My lovely wife also got me a Cambro so I can have some lee way in getting my cooking done. I also got a Grantan knife, and I have not needed any trips to E.R. for cuts yet......which is nice. So here is to 2015. May it please be a great year for everyone. I hope to see y'all on the circuit. Y'all take care, and Riley says, "Shut the #(%$ door. It's friggin' cold out there."